Bas-relief or low relief is a type of sculpture in which an image is projected at a shallow depth. This technique is often used in the art of ancient Egypt and other Near Eastern cultures. In addition, bas-reliefs can be found in Asian art, including that of ancient India. One of the largest bas-relief sculptures in the country can be found at Unakoti, which is situated in the northeastern state of Tripura. The name Unakoti means ‘one less than a crore’ (a crore being a unit in the Indian Numbering System which is equivalent to ten million in the Arabic Numbering System), and has its origins in Hindu mythology. One of the bas-reliefs at Unakoti. Source: unakoti.nic.in. According to Hindu belief, the god Shiva was travelling to Kashi (Varanasi), one of the holiest cities in India, along with an entourage of deities. Including Shiva, these deities numbered at ten million. When the deities arrived at Unakoti, they decided to stay for the night. Before going to sleep, Shiva had instructed his entourage to wake up at sunrise so as to continue their long journey. When dawn broke the next day, however, only Shiva was awake, whilst the rest of the deities were still fast asleep. As a result, Shiva continued his journey to Kashi on his own. In addition, Shiva cursed his fellow deities, and turned them into stones. Hence, Unakoti’s name refers to the number of deities turned into stone by the enraged Shiva. There is also an alternative myth regarding the way Unakoti got its name. This myth is about a famous sculptor by the name of Kalu Kamar. According to the story, the sculptor intended to make Unakoti a site of pilgrimage by carving onto the rocks the images of a crore of deities. His desire was not fulfilled, however, as he was just one image short of completion. Although the bas-reliefs in Unakoti may be the work of Kalu Kamar, in truth nobody really knows who made them. Unakoti’s bas-reliefs are even more mysterious, given the fact that there is neither certainty as to the time they were carved (The official website of the Unakoti District dates the reliefs to between the 11th and 12th centuries A.D.) nor the reason for their carving in such a secluded place. What is known about the reliefs of Unakoti is their subject matter. The reliefs of Unakoti depict a multitude of Hindu deities. The most famous of the Unakoti reliefs is perhaps a figure of the face of Shiva known as the ‘Unokotiswara Kal Bhairava’. This image measures at about 9 meters (30 feet) in height, including an elaborate headdress which takes up a third of the entire relief. The figure is flanked by two goddesses on each side, one being Durga, identified by the lion she is standing astride on, and another unidentifiable goddess. Due to the presence of the images of Shiva and Durga, one of the major Hindu festivals celebrated at Unakoti is the Ashokastami festival. This festival, which takes place between March and April each year, celebrates the victory of Rama over the evil king of Lanka, Ravana. According to the Ramayana, Rama was unable to slay Ravana, as he was protected by the goddess Kali. In order to change the allegiance of Kali, Rama was advised to worship and propitiate the goddess. Once Kali was on the side of Rama, he was able to slay Ravana. The legend tells that in celebration of his victory, Rama took Shiva and Durga (one of the forms of Kali) for a ride on his chariot. The Ashokastami festival today is a re-enactment of this victory. Although Unakoti is a well-known pilgrimage site for Hindus, there is much more to learn about the site and its reliefs. Apart from the lack of information regarding the age of the reliefs and the people who made them, it is also unclear as to the total number of reliefs. According to an assessment made by the Archaeological Survey of India, it seems that there are still reliefs and statues in the jungle yet to be discovered. Perhaps one of these undiscovered objects may provide us with more information about these works of art. 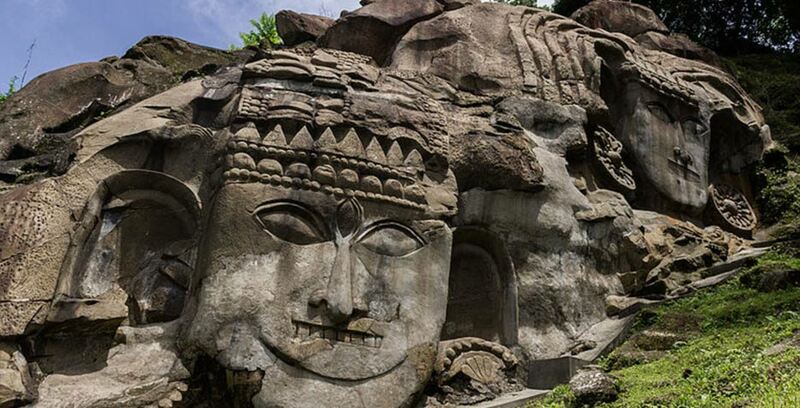 It has also been speculated that Unakoti might be added into the list of UNESCO’s World Heritage Sites. Perhaps this would spur researchers to find new information about Unakoti and its magnificent bas-reliefs. Melton, J. G., 2011. Ashokashtami. In: J. G. Melton, ed. Religious Celebrations: An Encyclopedia of Holidays, Festivals, Solemn Observances, and Spiritual Commemorations. Santa Barbara: ABC-CLIO, p. 46. Read more about What is a Lingam and How Does It Represent Shiva?